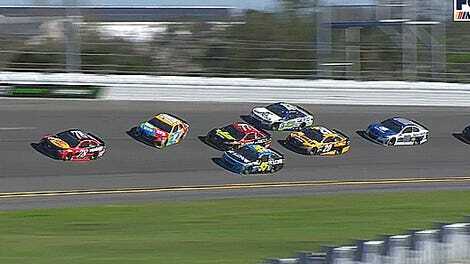 After a string of two crashes in a row, the Daytona 500 has done it again with 59 laps to go. 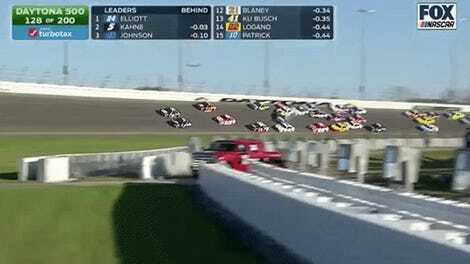 Jamie McMurray is involved once again, turning the car of Chase Elliott into Michael McDowell, causing a gigantic pile-up on Daytona International Speedway. Even the commentators have started calling it a wreckfest. Three-quarters of the 40-car field have been involved in a crash at this point. Holy crap, guys. Chill out. McMurray won’t be causing any more trouble with aggressive moves, however, as he’s retired to the garage. 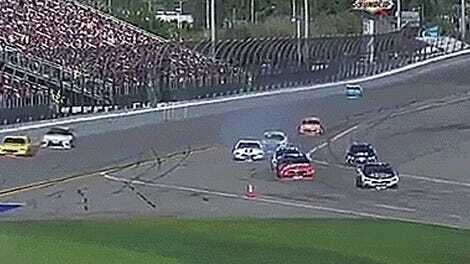 Brad Keselowski is also out of the race following this incident. Counting the two frustrating stage breaks, this is the sixth caution period of the day. UPDATE: Here’s another crash that happened shortly afterwards with 51 laps to go, where a tap from Chase Elliott sent Joey Gase sliding into Brendan Gaughan, and then into the grass. Can’t we have a nice break of clean racing? Only five drivers (out of 40!) have not been involved in wrecks so far: Aric Almirola, Ty Dillon, Kasey Kahne, AJ Allmendinger, and Michael Waltrip. How Was Stage 2 So Clean?